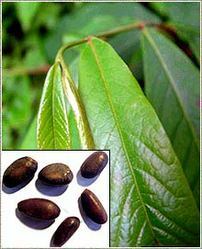 Uses : There are medicinal application of the custard apple tree. The bark and leaves contain annonaine, an alkaloid. A bark decoction is used to stop diarrhea, while the root is used in the treatment of dysentery. A decoction of the leaves is used as a cold remedy and to clarify urine. Annona squamosa Linn., family Annonaceae, is said to show varied medicinal effects, including insecticide, antiovulatory and abortifacient.The fruits of Annona are Haematinic, cooling, sedative, stimulant, expectorant, maturant, tonic. They are useful in anemia, burning sensation. The seeds are abortifacient and insecticidal and are useful in destroying lice in the hair. Leaves are used to overcome hysteria and fainting spells. Fruit is used in making of ice creams & milk beverages.